Oh my goodness gracious. These are so good. So very very good. Fluffy, rich, creamy, cheesy, light and gorgeously tender. Cheddar cheese scones (or biscuits as Americans would call them) are a quick bread – about half an hour from inception to eating. They dont require any special equipment, in fact I prefer to grate the butter and cheddar directly into the flour and mix with the fingers. You need to be quick in order to keep these scones light as air – and there is a little trick. Add the baking powder after you combine the flour, salt, cheese and butter. This will make sure that the leavening agent is given the best possible chance to make the scones really fluffy. I have always been fascinated by scones and biscuits. They taste so good, and look like they are easy to make… But they are not! It was a long time before I really began to understand the mechanics of how to make these perfectly. If you take your time, let the butter melt, or work the dough too hard, the scones can be thick and lumpy, with little rise. 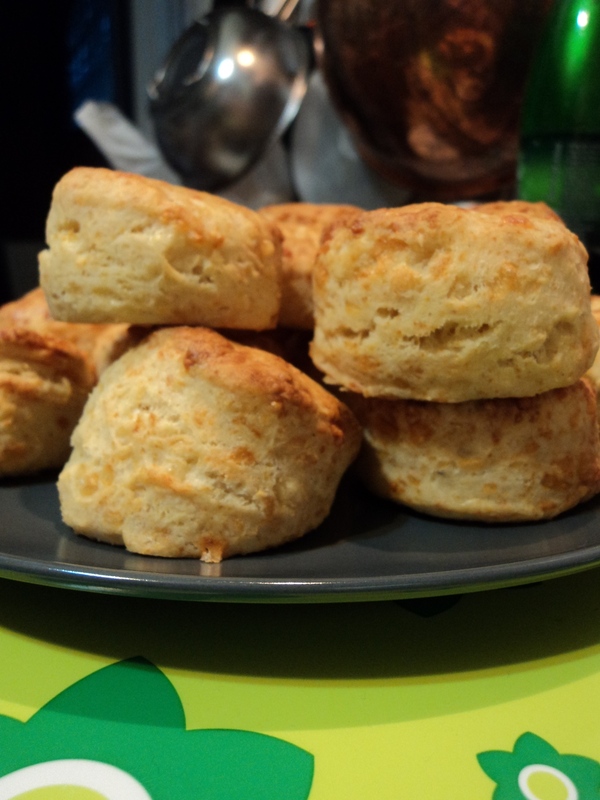 But if you have everything at the ready, dont forget to sift the dry ingredients, and use your fingertips (and cold butter, cheese and cream), then these scones really are quick and incredibly easy. These are deeply cheesy – and they really reflect the cheese you choose, so choose well – organic aged cheddar is best. These will be a wonderful addition to a party or celebration dinner. They can be cut in any shape or size, though I prefer smaller 1 1/2 inch circles. They are wonderful split and layered with cheese and tomato jam – or just as they are, especially just baked. They taste pretty phenomenal with a smear of strawberry jam too! Breakfast, lunch or dinner, these scones are deeply satisfying and totally delectable. Please do note that these are rich and stuffed with butter, cheese and cream. Theyre no diet food, but then I wouldnt eat them every day. They are the ultimate comfort food though. Eating one of these scones, hot from the oven is pure, perfect joy. Preheat your oven to 215C (425F), and line a baking sheet with parchment paper. Sift together about 3 cups of flour and the salt into a large mixing bowl. Keep the addition flour aside in case you need it to pull the scones together. Using the largest holes on your grater, grate 3/4 stick of butter directly onto the flour. Using your fingertips, quickly toss the butter into the flour. Grate 2 cups of cheddar and add it to the butter/flour mixture. Using your fingertips, mix well again. You should have a floury, pebbly, mealy mixture. Measure out the baking powder, and sift onto the dough mixture. Toss with your fingertips again to combine well. Crack some black pepper into the mixture if you like (I do), and toss again. Measure out your cream/milk/sour cream mixture. The more cream you add to the mix, the richer the scones will be. I use about 2 tbsp of sour cream, and then make up to about 6 fluid oz with cream, and add milk for the rest. Whisk together with a fork – the mixture will be lumpy from the sour cream, but this is fine. Pour your cream/milk mixture directly over the flour, and using your hands, knead the milk into the flour until a dough comes together. If its really wet, add a little more flour, a tablespoon at a time. You want a thick soft pliable dough that holds together, and yet feels very tender and delicate. This should take only a few kneads – treat the dough very gently and carefully because you want it to be as light as possible. Turn the dough out onto a firm working surface and pat into a rectangle or square about 1 1/2 inches thick. Use a round or cookie cutter to cut scones directly out of the rectangle, and move directly onto the baking sheet. Any left over scraps can be quickly patted together again and recut, but know that if you do this more than once, those scones will be flatter than the others! Let rest for about 3 – 5 minutes, and glaze with milk if you like (or even 1 egg whisked). This just encourages the top to brown well, but you dont need to do it if you dont want to! Bake in the oven for 10 – 15 minutes or until light, fluffy and well browned at the top. Dont over bake – they will continue to firm up once out of the oven. Let cool for 5 minutes or so on the baking sheet (though I usually cant resist trying at least one!) and serve immediately, or store tightly covered for 3 days.